Parasol Protactorate by *poisonmilow on dA. 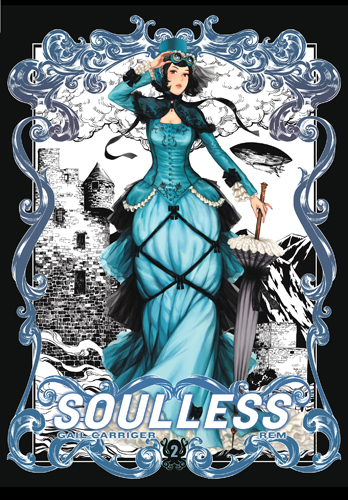 I’m back with another review of Soulless, the graphic novel version, which is hand-in-hand with Changeless, which I just posted a review about. Keeping in mind all my points from my Changeless review, I wanted to state that I loved the REM’s interpretation of Madame Lefoux and Lady Kingair. I felt that they were both extremely fitting for their images. Also, the heartbreaking scene at the end of the novel was, heartbreaking, yet again, in the graphic novel. REM has a strong hold over use of emotions and expressions. Things I wasn’t super fond of in this, was some of the cutting out of certain scenes. I do realize that they are trying to fit each novel into a single graphic novel, but I did find myself missing some selective scenes and extra bits of information that the novel supplied us. Her depiction of scene, the castle in the Scotts and the dirigible were fun and authentic to both era and the novel’s descriptions. Once again a fun and stunning installment of Soulless. I also wanted to share with you guys this little article I ran across. Gail Carriger went ahead and told people who she thought, as actors and actresses, her characters were modeled after. This influenced not only the picture at the top, but also the graphic novel version. So check it out if you’re interested. Ps. I plan to finish up Blameless and review it, but then I’ll try to break and review something else for a bit before going back to not overload you guys too much.